My 3rd-great-grandfather, Alfred Wharton Prettyman, was the man responsible for bringing the Prettyman family to Minnesota. I haven’t yet written a post about Alfred W. Prettyman, so this will be an overview of his life, to be built upon in future posts. By the time of Alfred’s birth, seven generations of his Prettyman ancestors had lived their lives on the Delmarva peninsula. The immigrant John Prettyman moved to the eastern shore of the Chesapeake Bay in 1643 (he actually immigrated from England a few years earlier, first settling on the the western shore of the Chesapeake Bay 1638, in St. Mary’s, Maryland). While the immigrant John died in the Virginia portion of the Delmarva peninsula, his son John and his descendants have lived in and around Sussex County, Delaware, ever since. In fact, this year marks 370 years that Prettymans have lived in Delaware, and 375 years that Prettymans have been in North America. Alfred Wharton Prettyman was born in Georgetown, Sussex County, Delaware, on December 1, 1823, to Robert Prettyman (1800–1863) and Elizabeth (Pepper) Prettyman (1803–1837). While Alfred would be the last Prettyman of his line to be born in Delaware, it was actually Alfred’s father, Robert Prettyman, who first broke tradition and departed the Prettyman’s ancestral stomping grounds in Delaware for the wilds of West Virginia (then just the western portion of Virginia). According to Edgar Cannon Prettyman’s 1968 work, The Prettyman Family in England and America, 1361–1968, Robert lived most of his life in Woodsfield, Ohio. Woodsfield is just about 15 miles to the west of the Ohio River and the West Virginia border. Alfred left home at 16 years old. He told his father if he beat him one more time he would leave and never come back. His father beat him again, so he left and never seen his father again. Alfred would have been 16 in 1840. By the time Alfred was 16, his father would have had two new children from his second marriage (to Lydia Lasure). I don’t know for certain where Alfred went after leaving his father’s family, but it appears to have not been very far. Two candidates for where he went were Perry Township (in the same county, just 6 straight-line miles to the south) or Bethel Township (in the same county, just about 11 straight-line miles to the southwest). Around 1845, he married Rebecca Harkcom, a 22-year-old Ohio native. Over the course of twenty years, Alfred and Rebecca had 12 children together, five of whom died in childhood. I find it curious that the Prettyman family history recorded by Edgar Cannon Prettyman and later supplemented by Edwin Coles states that “Alfred W. Prettyman married his cousin Miss Bentley first and had 11 children.” Due to extensive work done on the Harkcom family history by Francis Stills and others over the past three decades, it’s clear that Alfred’s wife’s name was Rebecca Harkcom, not Rebecca Bentley. Was this a mistake on the part of Edgar Cannon Prettyman that was repeated by Edwin Coles? Was Bentley a middle name or a nickname for Rebecca Harkcom? Is it possible that Rebecca Harkcom married a Bentley before she married Alfred? Until I find some evidence for the name Bentley besides statements by Edgar Prettyman and Edwin Coles, I’ll assume that “Bentley” was a mistake. But what about her being a cousin of Alfred’s? That may well turn out to be the case, but right now, the data I have don’t show a link between the two besides marriage. On November 3, 1850, Alfred and Rebecca were living in Bethel Township, in the southwestern corner of Monroe County, Ohio. Alfred is working as a farmer, and they have four children: William (4), Elizabeth (3), George (2), and Francis (1). The census taker recorded the fact that Rebecca could not read and write. By July 4th, 1860, Alfred and Rebecca had moved to Concord Township, Dodge County, Minnesota. Alfred was working as a miller, and they had four children living with them: George (12), Francis (10), Margaret (5), and Mary (3). 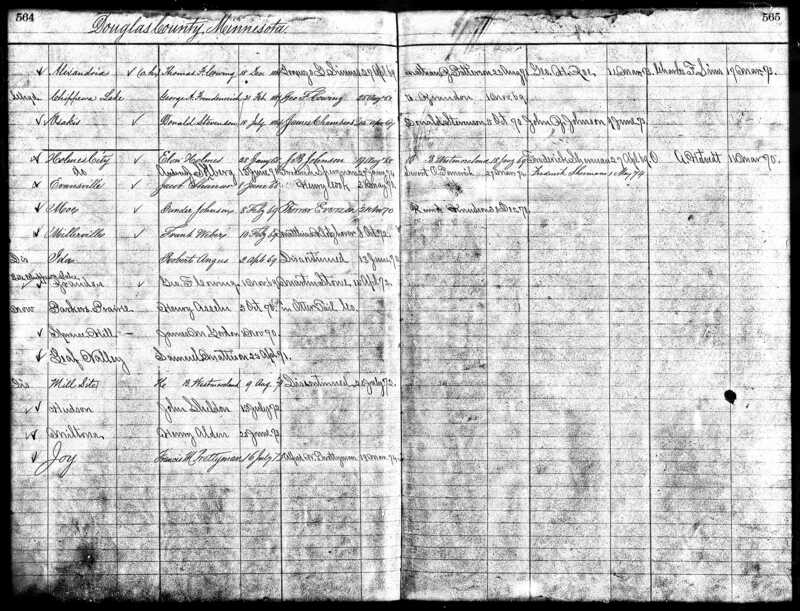 George, Francis, and Margaret were all born in Ohio, but 3-year-old Mary was born in Minnesota, so we can infer that they moved to Minnesota between 1855 and 1857. Eldest son William is not listed, but at age 14, it’s possible that he had already struck out on his own to look for work. It’s also possible that he died sometime between 1850 and 1860 (between the ages of 4 and 14 years old). Elizabeth is also not mentioned; she would have been about 13 years old. It seems most likely that she died between 1850 and 1860. I believe that there were also three additional children (names and sexes unknown) who were born and died between 1850 and 1860. On August 10, 1870, a 48-year-old Alfred was found living alone in the town of Carlos, in Douglas County, MN. He is listed as a farmer and owns $1000 worth of real estate, but has no personal effects worth any value, apparently. His wife Rebecca had died around 1865, and was buried back in the Milton Cemetery in Dodge County, about 200 miles to the southeast. None of his children were living with him in Carlos. In fact, two of his children, 7-year-old Alfred Minos Prettyman, and 8-year-old Lorraine Prettyman, were back in Dodge County, living with Joseph and Margaret Young, farmers in Milton Township. Note that Alfred was living two houses down from the Hasbrouck family. I’ll come back to them a little later. Unlike some of the other family homesteads I’ve been able to track down, this one appears to have been so completely transformed by modern farming techniques that no hint of the original buildings can be seen from the aerial photos. On May 1, 1875, a 51-year-old Alfred is found in the town of Spruce Hill, about 8 miles to the northeast of his homestead. All five of his surviving children were living with him—Francis Marian (26), Margaret (20), Mary Ann (18), Lorraine (14), and Alfred Minus (12). On July 3, 1875, Alfred took Lucy Caroline Hasbrouck for his second wife. This is the same Lucy C. Hasbrouck listed as the 14-year-old daughter of Alfred’s neighbor on the 1870 census. Theirs was a December-May relationship: he was 51½ years old, and Lucy was 19¼ years old—younger than all but his four youngest children. Alfred and Lucy would go on to have eight children together. On June 7, 1880, Alfred and Lucy were still living in Spruce Hill, where he is listed as being a grist miller. Two children from Alfred’s first marriage were living with them—Francis M. (31) and Alfred M. (17)—as well as three children born of Alfred’s current marriage—Frederick (4), Albert (2), and Edward (½). On June 12, 1885, Alfred and Lucy were still living in Spruce Hill. Francis has moved out, and Alfred Minos has married Mary Ann Horan and taken the house next door to his father and Lucy. Five of Albert and Lucy’s children were living with them: Fred (9), Albert (7), Edward (5), Ruth (4), and Richard (2). The 1890 census was lost to history, but I know that Alfred W. and Lucy Prettyman went on to have three more children: Morris (born right around the time of the above census), Walter (born April 1, 1887), and Joseph (born 1889). Richard and Joseph died in 1902 (Richard at age 19, and Joseph at age 13), and Morris died in 1905 at age 21. The rest of their children lived long, full lives. Alfred W. himself died on January 17, 1892, in Parkers Prairie, Otter Tail County, Minnesota, and is buried in the Parkers Prairie Cemetery, about 10 miles to the northwest of Spruce Hill. This entry was posted in 1840s, 1850s, 1860s, 1870s, 1880s, 1890s, Alfred M. Prettyman, Miller by Michael. Bookmark the permalink. Hi michael. your research is splendid…thank you! CA Prettyman was my grandfather. My mother, Joan Renee Prettyman Lennon, 86, is his last surviving child. Her mother was Rose Gores, who died tragically in a boating incident on the St. Croix River when my mom was 16. Rose Gores brother was Paul Gores, and their brother was Frank and sister Marie Gores Whitney, who attended all of our family gatherings over the years before she passed in St. Paul. My son Charlie is named after CA. He is a 19 year old college student in audio production, and I was quite pleased to see that CA had a musical background. I am the oldest of six and youngest brother Bill was a very accomplished musician. Another grandfather is FE Gores, a very prominent man in Wadena and ironically, just this week I have all of his 100-112 year old medals from the Catholic Order of Foresters and am about to have them mounted in one of those display boxes! Pleased to meet you, Chuck! It’s amazing to think that I’ve got so many close-ish family members back in Minnesota that I’ve rarely or never met. I hope to come back to visit in the next couple of years to remedy that. It’s always struck me as odd that I’ve seen my grandfather’s little sister only once or twice since I’ve been old enough to remember such things, the last of which must have been at least 30–35 years ago. It’s great to hear that you’ve got some of F.E. Gores’ medals. Do you happen to have anything else of his, or any photos of him? The only photos I’ve seen of him are the one from the Pioneer Journal Centennial (great, but low-res), and the two photos I was lucky enough to find in the Wadena County Historical Society (http://blackenedroots.com/blog/f-e-gores-city-grocer/). It would seem to me that such a prominent man in the community would have had oodles of photos taken of him. Come to think of it, I’ve only seen a handful of old photos of the Prettyman side of the family. My grandfather was very interested in his family history, so it’s especially odd that he seems to have inherited almost no family photos. There’s a story in there somewhere! Thank you for reaching out to me and reading my blog. I hope that we get to compare notes sometime soon about the Prettyman/Gores family history. There’s so much I’d like to know, and I hope that if I pick enough brains and gather enough tidbits, the larger stories and answers will start to come into focus. Will do. I’ll send them to you in a private email momentarily. Thanks!